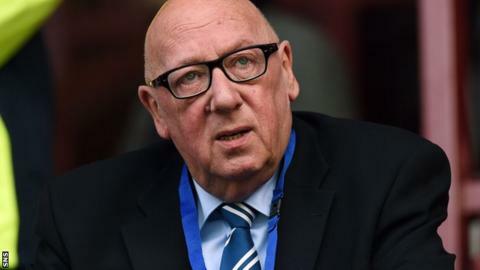 Turnbull Hutton is to give up his role as Raith Rovers chairman, the Scottish Championship club have announced. The news came as the Kirkcaldy club announced a profit of £97,500 - a 20% increase - in the year until June. Rovers said Hutton had indicated his intention several months ago and would continue in his role until a successor is chosen at the end of the year. He has been an outspoken chairman, often critical of the Scottish football establishment. Hutton led opposition against a proposal to place Rangers in the second tier of Scottish football after they suffered financial problems that eventually led the Glasgow club to the bottom tier. The retired former drinks industry director joined the Rovers board in 2000 and is in his second spell as chairman. "Over the next few weeks, there will be appointments of new directors with a view to having a new board in place by the end of the year." "The board would like to take this opportunity to publicly thank Turnbull for all his efforts, experience, wit and devil's advocacy and can state, without doubt, that the club remains in existence largely due to his leadership through some difficult and challenging times over the last decade," said a statement on the Kirkcaldy club's website. "Whilst remaining a significant shareholder, Turnbull is of the opinion that with age and health becoming factors, as well as family commitments, the time and circumstances are right for him to enjoy his football from the main stand. "Work has been ongoing for some considerable time towards re-aligning the various companies within the RRFC framework and there is a consensus that we ideally require only two companies in the future - Raith Rovers and Stark's Park Properties - ideally with cross representation on the respective Boards. "Over the next few weeks, there will be appointments of new directors with a view to having a new board in place by the end of the year. "This new board will then elect a new chairman." Rovers' accounts showed an increase in profits from last year's £81,000, "achieved by an increase in turnover of 23.7%, up to £1.29m, and despite increased costs, which included additional expenditure of £75,000 incurred in close season 2014 by way of improvements to stadium infrastructure and maintenance". "As at 30 June 2014, only loans from directors of £88,000 and inter-company debts totalling £338,000 remained outstanding," the statement added.